"The crowd's got to have something to believe in. They quit believing, they quit coming." During the depths of the Great Depression, times were tough and there were precious few ways one could better one's lot in life. One of the long shots was the fad of the dance marathon, where couples would attempt to win big prizes by staying on their feet for 50 or more days at a time. Although highly cruel to the participants, the public enjoyed watching people whose lot was even worse than their own. 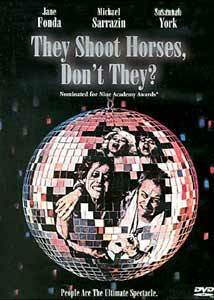 Such is the case in Sidney Pollack's They Shoot Horses, Don't They?, one of the most notable films of 1969. Set in 1932 California, almost the entire film is shot within the confines of a recreated ballroom. In that room is a cast of interesting cases. Hard-luck Gloria (Jane Fonda) is bitter and cynical but clinging desperately to hope of winning the competition and the 1500 silver dollars that are the grand prize. Robert (Michael Sarrazin) is a drifting farm boy, pulled into being Gloria's partner when her boyfriend is diagnosed with bronchitis. Alice LeBlanc (Susannah York) is a British actress trying to make her mark in Hollywood. Harry (Red Buttons) is an overage sailor with a skill for tap dance and boundless energy. Jimmy (Bruce Dern) and Ruby (Bonnie Bedelia) are a young couple expecting their first child and out to win the prize to be able to provide for him. Presiding over these and nearly 100 other couples is the manipulative promoter Rocky (Gig Young, in an Oscar®-winning performance), who takes a page from the book of Ben Birney with his trademark "Yowsah, Yowsah, Yowsah!" On Friday nights of such marathons, the promoters would often hold a Derby, where the participants would race-walk as fast as they could for ten minutes, with the last three couples being eliminated. Pollack emphasizes the cutthroat and exhausting nature of the Derby in this film by running the first one in real time, so that we spend the full ten minutes in excruciating pain with the dancers. Interspersed with the increasingly ragged and exhausted dancers are brief and cryptic flashes (we're initially unsure as to whether they are flashbacks or flashforwards) to Robert being held and interrogated by the police. The claustrophobia of the depression is echoed in the close nature of the ballroom; it is almost shocking when Robert opens a door to look at the sunset. As time wears on, the camera work becomes increasingly disoriented and the picture swings violently at times to mirror the barely conscious nature of the participants. The cast is first-rate throughout the picture, with Fonda's hard edge clearly contrasting against Sarrazin's low-key westerner. Red Buttons in particular is noteworthy as the sailor who holds his own with kids twenty years younger than he is; his crewcut helps him keep visually intact where the other men are visibly falling apart. A young Bruce Dern is highly intense as the firebrand Jimmy. The story is ever-more bleak and depressing, especially as Gloria and Robert learn more and more about the seamy underbelly of the dance marathon business as run by Rocky. Even though Gloria is outwardly cynical, she still clings to her romantic dreams until there is no escape from the realities of the situation. Once she has nothing to believe in, she can't go on, just as the audience quits coming if they don't have something to believe in as well. Image Transfer Review: The nonanamorphic picture is somewhat on the disappointing side. Although the color is good, the blacks are highly variable; in some parts of the film they are excellent, and in others are only a light medium grey. The widescreen side is lacking a little in definition, since there are so few scan lines to work with. The video rate is a fairly low 3-5 Mbps, which is really too low for a film with as much motion as this one; on numerous occasions digital motion artifacts are readily visible. There are occasional spots and speckles, but the source print is in excellent condition. The full frame side features a pan & scan transfer which gains in definition, but which omits nearly half of the picture information. This is hardly an acceptable tradeoff for most viewers, but the option is there. This is a title which really should be revisited with an anamorphic transfer. Audio Transfer Review: The sound is a 2.0 DD stereo. There is decent left-right directionality, but there are some significant problems with the sound. The looping of lines is painfully obvious, with completely different background sounds accompanying various lines of dialogue in a single conversation. Also at times there is a highly obnoxious and loud hiss, but this is only intermittent. Some serious restoration work needs to be done on this audio track. Extras Review: There is a brief (6m:29s) promotional featurette from the time of filming. While not in the best of condition, it does contain some interesting material, such as an interview with Noble 'Kid' Chissell, a former dance marathon champion who also has a bit part in the film as a trainer. We also see Pollack and Sarrazin jamming with the house band in an amusing little behind-the-scenes glimpse. But there's just not enough time to cover much of substance here. A 2.35:1 trailer is also included, with tag information about the awards won by the film. Chaptering is nearly inadequate; a film of this length should have a great deal more chapters than a mere 17. As is usual for Anchor Bay, no subtitles are included. A powerful drama with a superb cast, unfortunately given a lackluster transfer with little in the way of extras. Recommended nonetheless for the film's content.